On 6th September 1970, three airliners (TWA, Swissair and BOAC), along with more than four hundred hostages, were hijacked by the Popular Front for the Liberation of Palestine. Two of the planes were taken to a former RAF airstrip in the middle of the Jordanian desert, known as Dawson’s Field. 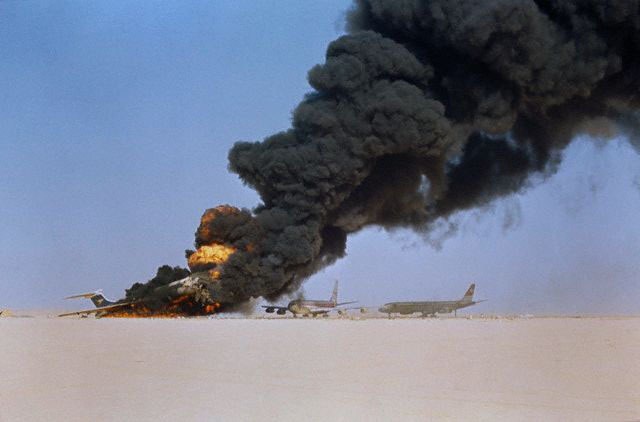 A third was blown up in Cairo after the passengers and crew were released. Another terrorist team tried to hijack an El Al Boeing over London but security staff foiled the attempt and captured one of the hijackers, Leila Khaled, alive. The plane was diverted to Heathrow, the nearest airport. Khaled, who had been in charge of the operation, was taken into British custody. The PFLP demanded Khaled’s release – as well as the release of other terrorists. To emphasise the point, a few days later the group hijacked another plane, a BOAC VC-10. The guerrillas now held over 300 hostages, 65 of them British. On 12th September as a warning signal they blew up the three planes. That act, seen around the world on television, brought home to British officials inAmman the seriousness of the terrorists’ intentions. 40 hostages were taken from the planes minutes before explosions destroyed the grounded jets. A period of tense negotiation followed the blowing up of the three airliners. The liberation of the remaining hostages seemed to hinge on the release of the captured terrorist being held in the UK, Leila Khaled, and six other terrorists being held in Switzerland and Germany. The UK Government faced the dilemma of releasing Khaled – and risk being accused of giving in to terrorism – or endangering the lives of the British hostages. UK Prime Minister Edward Heath eventually agreed that Britain had no choice but to free Leila Khaled. At 7pm on 13th September, the BBC World Service broadcast a government announcement in Arabic saying that the UK would swap Khaled for the hostages.